Microsoft's search engine garnered 33% of the US market share back in August, equivalent to "only" 5 billion searches worldwide. It is the second most popular search engine after Google and boasts several features over its competitors. When someone wants to find something on the Internet, it is likely that the default search engine will be Google. It’s almost expected as the Mountain View, Calif.-based giant has become the most popular among its peers, making it hard for others to catch-up. But Microsoft tweeted lately that Bing, its own search engine, is doing good (if not great) as it garnered back in August 33% of the US market share. This logically prompts the question whether it is time to seriously consider that “Bing is [indeed far] bigger than [we] think”. Search engines are “programs that search documents for specified keywords and return a list of the documents where the keywords are found”. It broadly refers to many programs but people generally associate it with Google, Bing and Yahoo that are used for World Wide Web searches. Microsoft (NASDAQ:MSFT) created and launched Bing in 2009 (12 years later than Google Search) but it already had earlier versions like Live Search, Windows Live Search and MSN Search. Microsoft markets Bing as a “Decision Engine”, promising to give search results that specifically address the searcher’s needs, minus the junk. According to Redmond, Bing has a worldwide market share of 9% with the US posting the largest share per country with 33%, which amounts to 5 billion out of 12 billion searches worldwide. Apart from the US, other large shares by Bing were achieved in the United Kingdom (25%), Taiwan (24%), Hongkong (19%), France (18%), Norway (17%) and Canada (17%). All these countries combined translate to only a total of 2.4 billion searches. There are reasons though that 33% US share is achievable. One, Microsoft also currently runs Yahoo’s search engine and Bing is the default for Siri (Apple’s digital virtual assistant). 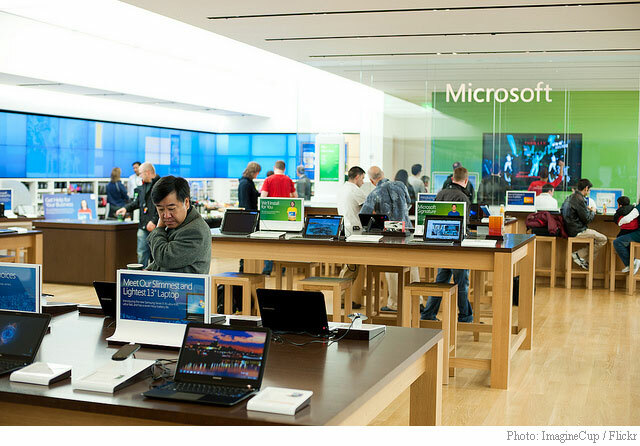 Two, for newly-sold Windows computers, the default browsers are Internet Explorer and Edge which bring more exposure to Bing. The data, however, is an incomplete view given that comScore does not measure mobile searches which are more significant as more people are increasingly using mobile apps instead of typing the address in a browser. In this category, StatCounter reports that Google got the lion share of 95%. As the trend has remained largely unchanged, comScore has de-emphasized its search market results. Are there any reasons for Google loyalists to switch to Bing? Some believers say so. They say Bing generally performs as well as Google, looks and feel are almost equal. Some say Bing has the upper hand in image and video search features, and autocomplete suggestions. Moreover, there is an existing Bing rewards system tied-up when you use Microsoft’s search engine. “Bing is bigger than you think” is an effort of Microsoft to stamp out its image as a distant second to Google, a competitor who keeps on innovating and who has a good headstart in so many areas already. Microsoft introduced new features of its Bing app for Android and involved itself with projects like FaceSwap in the hopes of gaining some distance. While Bing cannot knock off Google from its top spot (at least, for now) the fact that they already have a third of the US market share (which is not an easy feat), says a lot about the company’s new direction under Nadella and his focus on user priority. I haven’t used Google in years. I have an Microsoft Edition Android phone and use Bing. Its just better in every way. Google is to Bing as Atari is to Nintendo. Bing rewards are great as well. And Google pads their numbers as well. They filter all google sites (like gmail) through google.com to get their alexa rank up and they deploy malware botnets to keep up their clicks. This was seen after the FBI and Microsoft took down a botnet, and Google dropped to Alexa rank 3 for a month and another month went by and it popped back up. They cheat, but all fair in business. Its just Bing is better.